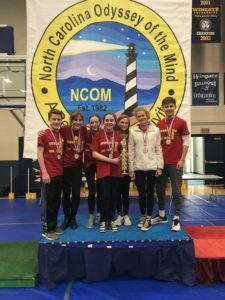 Iowa-bound: Bailey Middle Odyssey of the Mind team wins at Wingate! They competed in the middle school division, solving Problem 5— A Stellar Hangout. The team, which won first place at World Finals last year at Michigan State, include seventh graders Alex Cutcliff, Kate Baker, Sydney Baker, Stephanie Colella, Ashlyn Ayers, Johanna Anderson and Evan Totillo. The coaches are Joanie Baker and Theresa Colella. Odyseey of the Mind is about working together to solve a predefined problem and present their solution to the problem. There is also a “live” segment where contestants generate solutions to a problem they have not seen before. More than 50 schools in the Central Carolina region compete. There are five problems in the competition from which schools can choose. Schools and community groups purchase a membership and form teams of up to seven students. Teams from throughout the U.S. and more than 20 other countries participate in the program. The 39th World Finals will be hosted by Iowa State University and the Ames Convention & Visitors Bureau May 23-26. 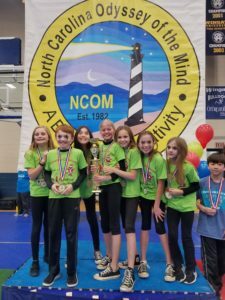 The Cornelius Elementary School Odyssey of the Mind team took first place at Wingate University and is advancing to the world finals at Iowa State as well. Members of the team includes 5th graders (l-r) Addison Davis, JP Rosser, Rhianna Zhu, Amelia Hunt, Hayden Garvey-Knapp, Bridget Lyon, and Imogen Ames. The team is coached by parents Jo Wise-Ames and Erin Garvey.